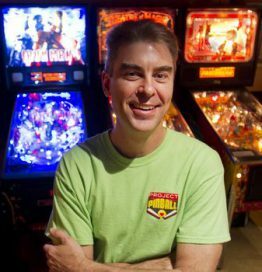 Daniel Spolar, age 49, has lived in Southwest Florida for 28 years and has spent the last 11 year of his life securely involved in the pinball community. Player, tournament director and machine restorer, Daniel’s passions lie deeply in all things pinball. These passions came together in an idea today known as Project Pinball Charity Group Inc. When approached back in 2011 about a broken-down machine in Golisano’s Children’s Hospital (Fort Myers, FL), Daniel knew that he was the only man for the job. After 112 hours of work, the Spider-ManTM machine was once again up and running with a new monthly maintenance plan in place. Seeing the joy this machine brought to these kids inspired Daniel to work towards a new goal. Today Daniel continues his love of the game by heading the charity, working vigilantly across America in hopes of one day placing a machine in every Children’s Hospital. As of today, Project Pinball Charity has placed 18 machines from coast to coast. Daniel’s greatest motivation and inspiration derive from his wonderful wife, three kids, and two grandchildren.